Young adults: For more than 15 years, the Jewish Organizing Fellowship has placed young adults between the ages of 21-30 as organizers for change with community-based organizations in the Boston area. Fellows receive high-level training and mentoring in leadership and community organizing skills as well as engage in intensive Jewish reflection and study, connecting their passion to build a more just world with Jewish values. 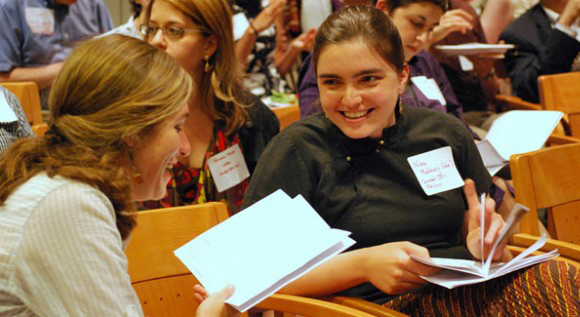 Clergy and Rabbinical Students: The Clergy Leadership & Organizing Program invests in promising rabbinical students and rabbis, training them to use community organizing tools such as relationship building, leadership development, and collective action. In 2010, JOIN for Justice began training rabbinical, cantorial and Jewish education students in community organizing principles, taking over responsibility for a project begun by Jewish Funds for Justice (now Bend the Arc) in 2005. Today more than 400 alumni of JOIN trainings, workshops and mentorship are serving in pulpits, campuses, and organizations across the country. Many of these alumni are actively engaging their congregations in strengthening communities and working for justice. ROAR! A Jewish Leadership Training for Resistance, Organizing, Action, and Resilience: JOIN is working to directly support campaigns that cross race, class, faith, and ethnicity, in opposing the new administration’s rollback of fundamental rights, helping lay the groundwork for changes that will move the country in a different direction. Through the wisdom of community organizing, our ROAR trainings explore campaign development and the cycle of campaigns that progress, step by step, to build power and have the greatest possible impact. We explore how to work across lines of difference, how to find strength and resilience to allow us to work for justice long-term, and how Jewish wisdom can guide us and ground us in this moment. Over 760 people have attended ROAR trainings in 19 cities around the country, from the coasts to the South to the Midwest. Jewish lay leaders interested in social justice: JOIN for Justice is delighted to invite Jewish communities across the country to join us in our groundbreaking Online Institute, a virtual space where Jews across the country can learn organizing through various online opportunities. In Spring 2016 the Online Institute will offer Don’t Kvetch, Organize!, aimed particularly at volunteer leaders who are inspired by their Jewish identity to take action in their communities. Jewish congregations, organizations and institutional leaders: Through our consulting and training work, JOIN for Justice trains and mentors Jewish professionals across the country in how to apply organizing skills to build community and achieve collective goals. JOIN offers a range of consulting services to strengthen the organizing practice of individuals, organizations, and coalitions in the Jewish community. We seek to work with our partners over many months or even years, and for them to form lasting connections to JOIN and to each other.